As I write this article, April is already more than half over. In North Korea, the party is over, bar the shouting. But in Pyongyang, the shouting never really stops, or not for long anyway. Lest you imagine this has anything to do with art, the official Korean Central News Agency (KCNA) was commendably candid. Announcing the festival on March 29, KCNA hailed the “over 50 art troupes from 20 odd countries… Their performances will be devoted to praising President Kim Il Sung, revered as the sun of Juche by the world progressives.” That surely can’t apply to the Festival’s most unlikely performers: the Sons of Jubal, a 150-strong male chorus who are all Baptist music ministers from Georgia (the US state, not the country). So much for aesthetics. One important date yet to come is April 25. That’s Army Day, which this year marks the 80th anniversary of the Korean People’s Army (KPA). Like much in the DPRK’s official history, this is fiction. The real KPA wasn’t formed until 1948, on February 8. That was the date they celebrated until 1978, when it got pushed back to mark instead the supposed founding of Kim Il Sung’s tiny guerrilla band in 1932. In North Korea, after all, myth rules. Just in case the rumors are right and the DPRK is contemplating a nuclear test to compensate for the failed rocket launch on April 13, then April 25 might be deemed an appropriate date for it. But this article lays off the rocketry, amply covered by 38 North of late, to look instead at the politics which unfolded in Pyongyang last week. What happened, and what have we learned? The answer is: Quite a lot, on both counts. Enough to burst the bounds of a single article. What happened were two important meetings, one habitual and the other not. The Supreme People’s Assembly (SPA), North Korea’s version of a parliament, always meets at this time of year, just for a day. I’ll get to that in Part II (coming soon). But the Party comes first, in every sense. The SPA met on April 13, the same day as that ill-fated rocket—and two days after the ruling Korean Workers’ Party (KWP) held a rare delegate conference, which was the main event. A KWP conference, be it noted, is not the same as a KWP congress. Due process is hardly a DPRK specialty, but one does wonder whether they’ve completely given up on the full Party Congresses, which, by the rules, are supposed to be held every five years. Nearly a third of a century has elapsed since the last one (the Sixth) in October 1980. That was when Kim Jong Il—hitherto obliquely referred to as the ‘Party Center’—was first revealed to the world. A KCNA article on February 28 casually mentioned in passing that “decades had passed since the Sixth Congress of the KWP,” but apparently felt no obligation to explain this anomaly. KCNA was more revealing on what party conferences are for. Indeed, the article headline is “Koreans Recall History of KWP Conferences.” They are “held to settle the urgent problems of the times.” Thus “the Party conference in March 1958 reviewed the work of wiping out (sic) those engaged in factional tricks within the Party.” ‘Wiping out’: that’s honest – and no metaphor. This, of course, is when Kim Il Sung finished purging those comrades whose idea of communism was something other than one man’s arbitrary tyranny. The main action took place in 1956, as recounted in Andrei Lankov’s gripping 2004 book Crisis in North Korea. What KCNA doesn’t say is that the 1966 conference was also when Kim extended one-man rule to one-family rule, initially by positioning his brother Kim Yong Ju as successor. Again some comrades tried to stop this (the Kapsan faction), and again they met a sticky end. And then no more KWP conferences for 40 years, though they did manage two Congresses in 1970 and 1980 before those petered out as well. But in 2010 the conference format sprang back to life, as did the Party top echelons, and now we’ve had two just 19 months apart. For whatever reason, this was the medium chosen to launch Kim Jong Un. September 2010 saw his first public appearance, and now as widely predicted he has assumed the top party job. To be precise, and continuing the bizarre practice whereby mere physical death is no bar to nominal office in the DPRK, the April 11 meeting saw the late Kim Jong Il designated as ‘eternal general secretary,’ while his still sentient son got a new title: that of first secretary. Kim Jong Un also now chairs the KWP Central Military Commission (CMC). Before, he had been one of two CMC vice-chairmen: a position created especially for him, and hitherto the only KWP post he held other than being a member of its Central Committee (CC). September 2010 saw a new full Politburo and Central Committee named for the first time since Kim Il Sung died in 1994. Now, barely a year and a half later, the KWP leadership has been drastically reshuffled again, which is hardly unexpected during a succession process. The new name to conjure with is Choe Ryong Hae, whose cup positively runneth over. Son of the late Choe Hyon, a guerrilla comrade of Kim Il Sung who became Minister of People’s Armed Forces (MPAF, i.e. defense minister), Choe has long been close to the Kim family. So close, in fact, that according to Bradley Martin, during their student days Kim Jong Il—a bit of a tearaway, back then—organized a rather crude and cruel sexual prank on his friend; who ever thereafter bore a nickname hinting at what might delicately be called self-reliance. Despite this, during the 1980s and 90s Choe helped smooth Kim Jong Il’s succession within the Party—especially in the Kim Il Sung Socialist Youth League, which he long headed until relieved in 1998. The official reason given was (unspecified) illness, but there were rumors of corruption. Several others, less well connected than Choe, may have paid with their lives. Or maybe at 48 he was simply deemed too old, though just a year ago he was again pictured leading a student loyalty rally—albeit, by then, surely a superannuated juvenile at age 61. Be that as it may, for eight years Choe Ryong Hae vanished from view. In 2006 he bounced back as party secretary for North Hwanghae province, south of Pyongyang. Four years later 2010’s KWP conference saw him recalled to the center in a big way. In one fell swoop Choe became a Party secretary and joined the CMC and—as an alternate member—the Politburo. Nor was this all. Alongside Kim Jong Un and his aunt, Kim Jong Il’s sister Kim Kyong Hui, Choe Ryong Hae was gazetted as a four-star KPA general, despite having no military career. One can only wonder what real generals, whose stripes have been hard-won, think of this. If at one level it shows the military’s clout—to be a real somebody in today’s Pyongyang, you have to be a general or pretend to be—at the same time, it surely devalues the rank. Choe hardly looks comfortable or convincing in uniform. He’d better get used to it, since he looks to be stuck with it, unlike that power couple of fellow toy-soldiers Kim Kyong Hui and husband Jang Song Thaek, who each only had to wear it once. Eagle-eyed readers please correct me, but I’ve only ever seen Kim Jong Il’s sister sporting her KPA general’s finery at the September 2010 KWP meeting, right after her promotion. Hubby Jang, who got his four stars (and his full Politburo membership) over a year later, wore KPA uniform on Christmas Day—not that they call it that, obviously—at Kim Jong Il’s bier, but was back in his usual civvies days later as one of the “Big 8” who walked beside the Lincoln hearse at the funeral. The sartorial plot thickens. In the platform party at the SPA on April 13, both husband and wife stood out. Kim Kyong Hui was the sole woman in the front row, while Jang was seated among the top brass on Kim Jong Un’s left—but was the only one of them not in uniform. The niceties of who wears uniforms and when appear elusive. The new commander-in-chief doesn’t seem to bother, any more than the old one did: was Kim Jong Il ever seen in military garb? His son’s sole dress innovation so far goes the other way: a new photograph shows Kim Jong Un wearing a western-style suit and tie instead of his usual Mao jacket. Kim Il Sung sometimes used to dress thus, but again I can’t recall ever seeing Kim Jong Il wearing a collar and tie. Make of all this what you will; maybe one shouldn’t obsess, but it intrigues. Military devaluation also occurs in another way, by dilution. Kim Jong Il used to promote big batches of KPA generals, no doubt to curry favor with them. His son is continuing this practice: on April 13 Kim Jong Un created 70 new generals, the second time he has done this in the few months since he became leader and C-in-C. Since Radiopress in Japan no longer seem to produce their invaluable North Korea Directory, I’m sadly not in a position to keep score. But vast though the KPA is, it must surely by now be overly top-heavy with top brass. But back to Choe Ryong Hae. Last week saw him further promoted, on all fronts. In the Party he succeeds Kim Jong Un as vice-chair of the CMC, and is also now one of the five members of the Politburo Presidium: the KWP’s topmost body. More strikingly, in military rank he has risen from general to vice-marshal: presumably the better to perform his new job—also announced last week—as director of the General Political Bureau of the KPA. To place a civilian in that role is remarkable. It suggests a bid to reassert Party control over a military which under Kim Jong Il rather ruled the roost. Then again, perhaps for balance, the thrust of the new Politburo appointments could be read the opposite way: as strengthening the KPA’s clout. Four of the six new full Politburo members are military men. 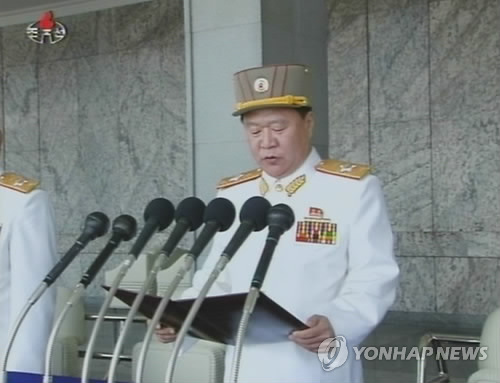 They include Kim Jong Gak: perhaps the hardest-faced of all the KPA top brass (a hotly contested title), appointed as MPAF on April 11 two months after being promoted to vice-marshal. He is 70. The others are Hyon Chol Hae (77), freshly promoted vice-marshal and newly appointed as MPAF first vice minister plus director of the General Logistics Bureau; and the ministers of both state and people’s security—readers of James Church know the difference. Kim Won Hong (newly appointed, aged 66) and Ri Myong Su (78), who has been in post a year. From 2007 to 2012 VMar Kim served as senior deputy (1st vice) director of the Korean People’s Army [KPA] General Political Department [GPD] (bureau), which is responsible for political control and ideological indoctrination of enlisted personnel and officers of the KPA… The position of GPD director has been vacant since the November 2010 death of VMar Jo Myong Rok (Cho Myo’ng-rok) and Kim’s February 2012 promotion initially suggested that he would be elevated to that position. Senior personnel changes at GPD are likely to become clearer as the next 72 hours unfold. All the more interesting, then, that this key post went instead to a civilian, hastily uniformed. The wider issue of the relative clout of the KWP and KPA is hard to assess. A useful chart of the new line-up, by Luke Herman, could be read as favoring the former. For one thing, the 5-man presidium contains only one true military man: vice-marshal Ri Yong-ho, who rose suddenly at the 2010 KWP meeting but seems to have marked time since. Contra the picture layout, recent DPRK press reports rank Ri below the jumped-up Choe Ryong Hae: here pictured in uniform, but surely to be counted as a civilian for present purposes. Scrolling down the mostly rather grim mug-shots, set out in rows of four, the next dozen are pretty solidly civilian. Only vice-marshal Kim Yong Chun—still ranked #6, though no longer defense minister—and the elderly Ri Yong Mu (aged 87, ranked #14) are in uniform. But the balance changes in the bottom row, consisting of the newly promoted military quartet named above. Also of note is the return of O Kuk Ryol to the Politburo, if only as an alternate member. Thirty years ago as Chief of General Staff he was a full member, after an already eventful career which by one account included flying sorties to defend Cairo from Israeli attack during the 1973 war; he went on to head the Air Force. 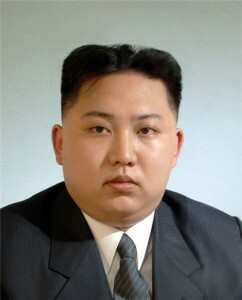 In the 1980s he reportedly played a key role in winning the KPA’s acceptance of Kim Jong Il’s succession. Sacked in 1988, apparently in a power struggle with the then MPAF O Jin U (no relation), he almost but not quite vanished from view: remaining a member of the Supreme People’s Assembly, on which more below. There are all kinds of rumors as to what else he may have got up to, from cyberwarfare to counterfeiting; can anyone confirm any of that? He re-emerged in public in 2009 as a vice-chairman of the National Defence Commission, which 38 North readers don’t need telling is the DPRK’s topmost executive body—outranking the merely civilian Cabinet. Presumably his return at (now) age 81 is because his smoothing skills are once more needed. Or, more dismayingly, might it also be part of a push to extend the pedigree principle? O is either the son or nephew of O Jung Hup, a partisan comrade of Kim Il Sung. In July 2010 he was present at a ceremony marking O Jung Hup’s centenary, when wreaths were laid before the latter’s bust in the Revolutionary Martyrs Cemetery on Mt. Taesong in Pyongyang. This seems to be becoming a habit. On April 9, almost on the eve of the KWP conference, much was made of the 30th anniversary of the death of Choe Hyon. Wreaths were laid at Mt. 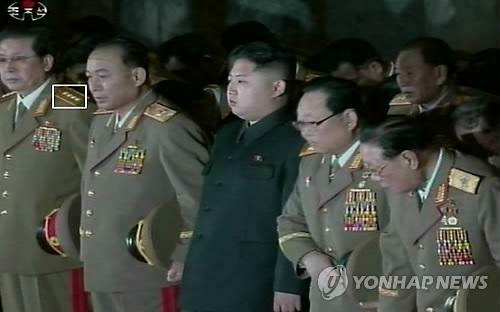 Taesong, and Choe was also honored by a national memorial service and a laudatory article in KCNA. His son Choe Ryong Hae, needless to say, was prominent at both the meetings. Observing this, one can only wonder if the hereditary principle is being expanded out from the Kims alone to solidify a wider yangban class in Pyongyang. In the 21st century, on the world’s most dynamic continent, a reactionary reversion to bloodlines in what is supposedly a socialist and meritocratic regime gives scant hope of change, much less progress. The Introduction can be read at http://www.uhpress.hawaii.edu/books/lankov-intro.pdf. Routledge, 2011; http://www.routledge.com/books/details/9780415666893. Kim is quoted on p 17. A more detailed account of Kim Il Sung’s call to arms is in Major Daniel P. Bolger, Scenes from an Unfinished War: Low Intensity Conflict in Korea 1966-1969, ch 2, http://www.kwva.org/second_korean_war.htm. For a summary account of this episode, see Jae-cheon Lim, Kim Jong Il’s Leadership of North Korea (Routledge 2011), pp 38-39, http://www.routledge.com/books/details/9780415666749/. Bradley K Martin, Under the Loving Care of the Fatherly Leader (St Martin’s Press, 2004), p 222. Martin says 1997, which is a year out. Martin op cit, pp 573-4. See http://nkleadershipwatch.wordpress.com/2012/04/11/kim-jong-gak-appointed-minister-of-peoples-armed-forces/; for Choe, scroll down to the fifth image and accompanying text. An interesting source, albeit itself unsourced and with some omissions and errors (such as claiming O Kuk Ryol is related to O Jin U) is http://hotair.com/greenroom/archives/2009/06/03/3887/. 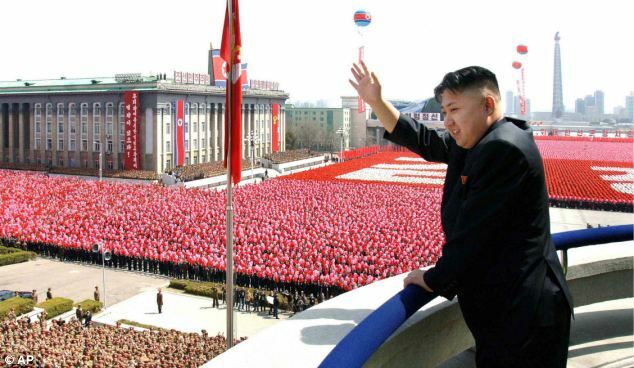 More recently, see Nicolas Levi at Sino-NK: http://sinonk.com/2012/02/01/o-kuk-ryol-the-old-guard-never-dies/. As always, Michael Madden is indispensable: http://nkleadershipwatch.wordpress.com/leadership-biographies/gen-o-kuk-ryol/. The website www.nk-news.net, which renders KCNA searchable from 1998 onwards, has only 27 mentions of O Kuk Ryol, none earlier than 2009. The wreath-laying is reported at http://www.kcna.co.jp/item/2012/201204/news10/20120410-25ee.html; the national memorial meeting at http://www.kcna.co.jp/item/2012/201204/news10/20120410-37ee.html; and the eulogy is at http://www.kcna.co.jp/item/2012/201204/news10/20120410-35ee.html.